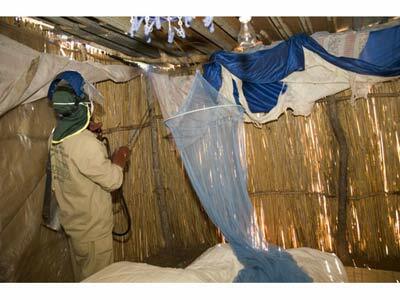 A LSDI (Lubombo Spatial Development Initiative) worker sprays a home for malaria control outside Maputo, Mozambique. Bill Gates, U.K. Prime Minister Gordon Brown, Bono, and other leaders convened in New York at the UN Millennium Development Goals Malaria Summit. At the Summit, Roll Back Malaria launched the Global Malaria Action Plan, a comprehensive strategy for worldwide malaria control. To help implement the Action Plan, leaders announced major new malaria commitments, including a $168 million Gates Foundation grant to the PATH Malaria Vaccine Initiative to develop next-generation malaria vaccines. Britain’s Prime Minister Gordon Brown spike on the likelihood that all countries will reach the “historic” moment of ending malaria deaths by 2015.